The most common mistake pool owners often make is that they do not add enough shock into the swimming pool when they are trying to clear green algae from the swimming pool. 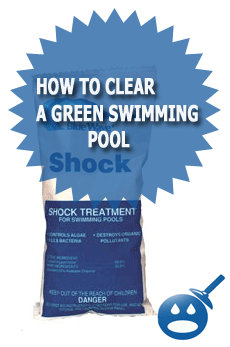 In fact many people do not even check the chlorine levels before they shock the pool. They just add a few bags of shock and then they just hope the pool will turn blue again when in fact the pool will not turn blue fast again if the proper steps are not taken. 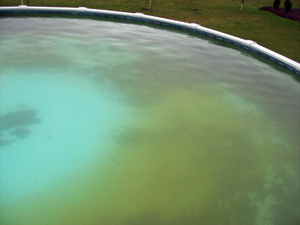 Not only is there green algae that can cause your pool to be all swampy looking, but there is also something called yellow algae that will also cause the pool filter to clog up. Yellow algae needs to be treated with a chemical called “yellow out”. This chemical is designed to get rid of all the yellow algae in the pool. But if you have green algae in your swimming pool you will need to heavily shock it, backwash many many times and also vacuum up as much of the algae as you can see in the pool before, during and after you shock the pool. The more green algae you remove from the pool as you are chemically treating it with shock and chlorine tabs, the faster the pool will turn blue again. If your swimming pool is totally green and you have a D.E. pool filter, you will want to make sure you completely clean out the filter before trying to clear up your pool. If your filter is caked up with last years D.E. 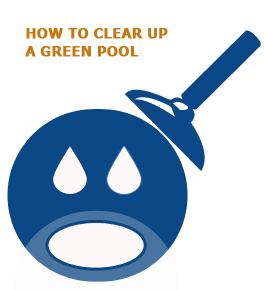 powder or just clogged up in general, you will never be able to clear up your green swimming pool. If you have a sand filter and the sand has not been changed in several years you may want to have the sand replaced to make sure that the filter is running at its best. If you have a cartridge filter and its in less then fair shape you will want to replace the cartridge before trying to clear the green algae from the pool. You will want to shock the pool at least once a day until the pool water is crystal clear and you can see the bottom. You will also want to run the swimming pool filter system 24 hours a day until the pool water is clear and then you will want to run it for another 48 hours before switching back to your normal operation. The general rule of thumb is that the greener your pool is with algae the more pool shock you are going to need to clear the swimming pool up. So if you have a pool that is totally green you will want to “triple shock” the pool. This means that you will want yo add three times the amount you normally would add when shocking the pool. It is also important to remember that you most likely will be shocking the swimming pool more then once even if it is only a bit green. 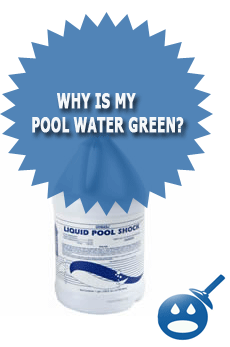 If the pool is really green you could be shocking it several times so make sure to buy a good amount of swimming pool shock in either liquid or powered form. You can find bulk deals on swimming pool shock at places like Walmart, Sam’s Club, Leslie’s Pool Supplies and other large swimming pool supply retailers. If there is a cartridge filter on the green pool you are trying to clear up you will want to make sure that the filter is in like new shape because it will be working very hard to clear the green pool water. You will want to clean the cartridge when the pressure rises 5 lbs above the normal operating pressure or when you start to see the pool jets in the pool slow down or have less flow then when the cartridge has just been cleaned. Once you have triple shocked the pool you will want to make yourself a backwash plan. 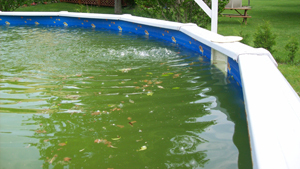 The more green your swimming pool is the more algae that is in the water that needs to be filtered out of the pool. This is done by running the filter system 24 hours a day until the pool water is clear and blue. When you first start the filter after shocking the pool, the backwash cycles maybe every 30 minutes to 2 hours depending on the size of your filter and how much green or yellow algae is in the pool water. As the pool starts to clear up the time between backwash cycles will extend. In some cases some pool owners will actually think there filter is broken because the backwash cycles are so short. But if you backwash and you see green slimy water coming out of the backwash like you know that the filter is doing its job. Take notice of the pressure on the filter gauge right after you backwash the filter. 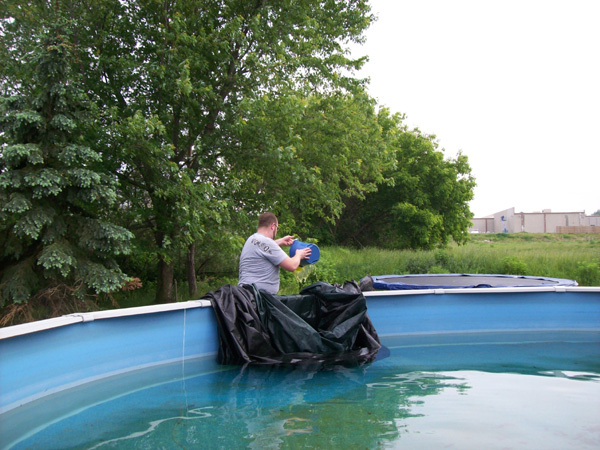 When the pressure on the gauge rises 5 – 10 lbs you will need to backwash the pool. If you are monitoring your swimming pool water from inside the house or somewhere you cannot see the filter gauge, you can look at the return jet inside of the pool. When you see the return jet start to slow down or have less flow you will need to backwash the pool filter. When the filter gets clogged with algae and debris it will allow less water to pass through it and that will make the gauge rise and the return jet flow slow down. Once you have let the shock work for a couple of hours some of the green algae that has not made it through the filter system can still be stuck to the pool walls and the pool floor. This algae may now be white or bleached from all the shock that was put into the pool water. You will want to connect and prime your vacuum hose and then turn your multi-port directional valve to the “waste” position. This will allow the water that is being vacuumed from the swimming pool to be pumped out instead of being filtered and then returned to the pool. If you vacuum the pool on filter you will wind up back washing like every 2 minutes because all of the algae from the pool will be filling the filter body as a super fast rate. You will find yourself out of suction and frustrated fast if you try to vacuum large amounts of green algae from your pool when the filter multi-port is set on filter. The first day you shock, backwash and slowly vacuum your swimming pool will be the worst. In the upcoming days you will need to shock your pool, backwash the filter and vacuum any missed spots of algae you can now see because the pool water is more clear. Make sure to add new D.E. to the pool filter through the skimmer every time to backwash the filter if you do in fact have a D.E. pool filter. You will most likely need 25+ pounds of D.E. Powder to clear a totally green swimming pool. when my Dyson vacuum is no longer usable. This causes symptoms such as a puffy face and bulging veins. Also, direct contact with water or steam must be avoided.